Need a great reason to participate in this month’s challenge? This prize should get your creative gears turning. We’ll pick a winner this month from the qualifying entries. The winner is chosen randomly from all the entries. Everyone has a chance to win – as long as you enter! We have a unique prize for this month’s challenge. Sponsored by the Bead Cruise and a whole list of awesome sponsors (see below) we are giving away one gift bag from Bead Cruise 2018! Yes, you can win an entire gift bag filled with beads, findings and supplies. 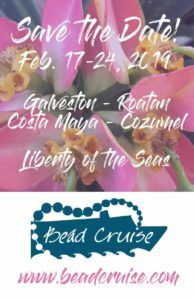 If you haven’t heard of the Bead Cruise, I organize this amazing bead retreat combined with a cruise. We create jewelry while we sail to tropical islands. On the islands we explore and relax in beautiful locations. Our 14th annual event happens February 2019 and details will be posted in the next few weeks at BeadCruise.com with registration opening at the end of the month. So, let’s dig into that bag of awesome bead swag! First up is a collection of findings from Nunn Design. 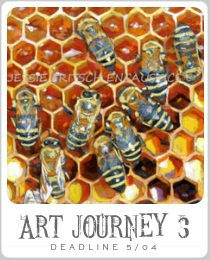 Fill those bezels with polymer clay or resin to make your own art beads. Check out the Nunn Design blog for tons of inspiration and ideas. Jess James Beads silver plated flower charms add some sparkle to your designs. 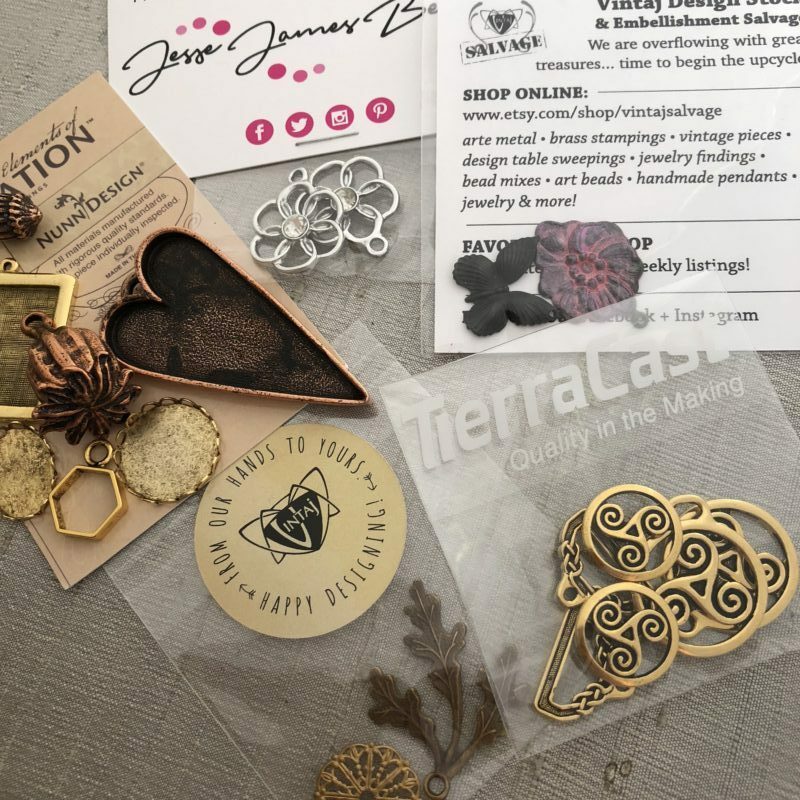 TierraCast sent a collection of findings in a Celtic design. Vintaj included an Oak Leaf Pendant and a tiny filigree charm. Vintaj Salvage, the closeout shop on Etsy for Vintaj, sent along a butterfly charm and colored flower connector. 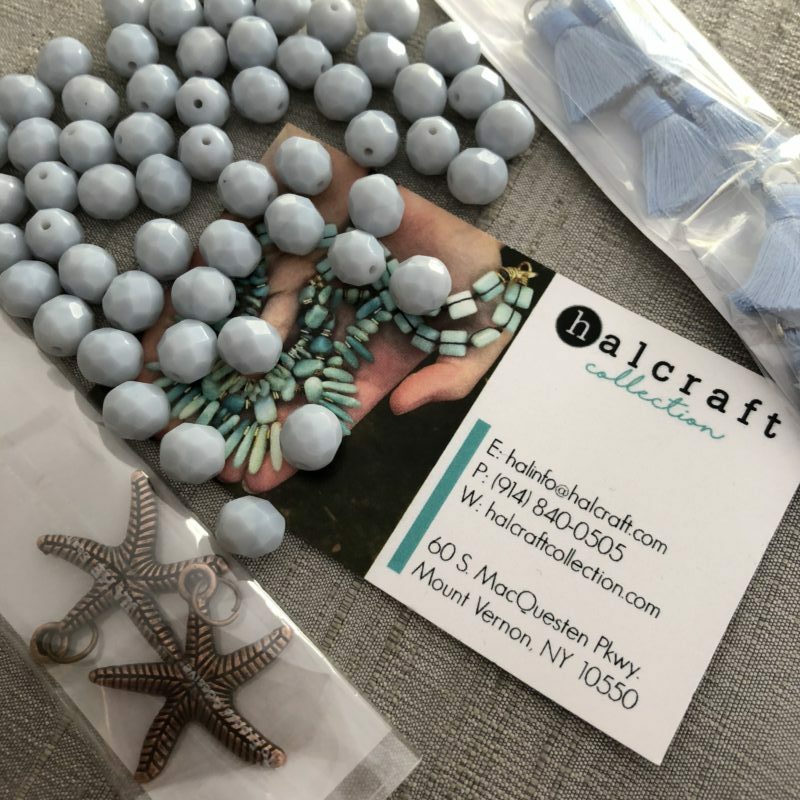 Halcraft Collection are best known for their Bead Gallery products available at Michael’s, but they also sell online now and offer some the cutest tiny tassels I’ve ever seen! 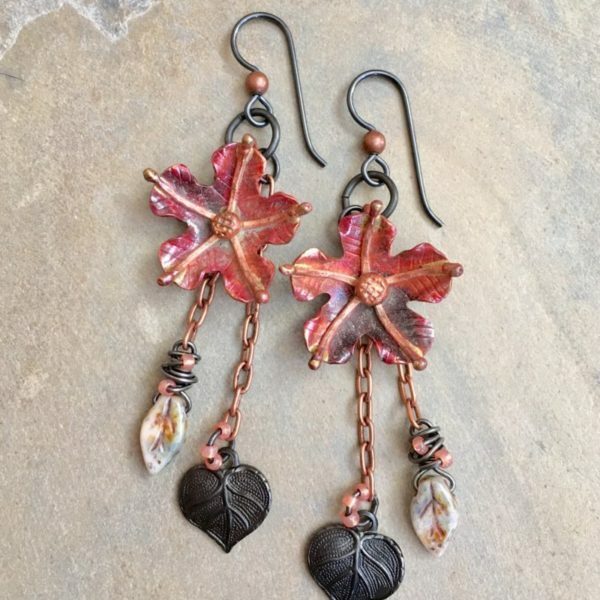 Czech glass and a metal starfish charms round out the offerings from Halcraft. Jess James Beads sent some of their signature bead mixes. I’m loving the peachy colors of summer! 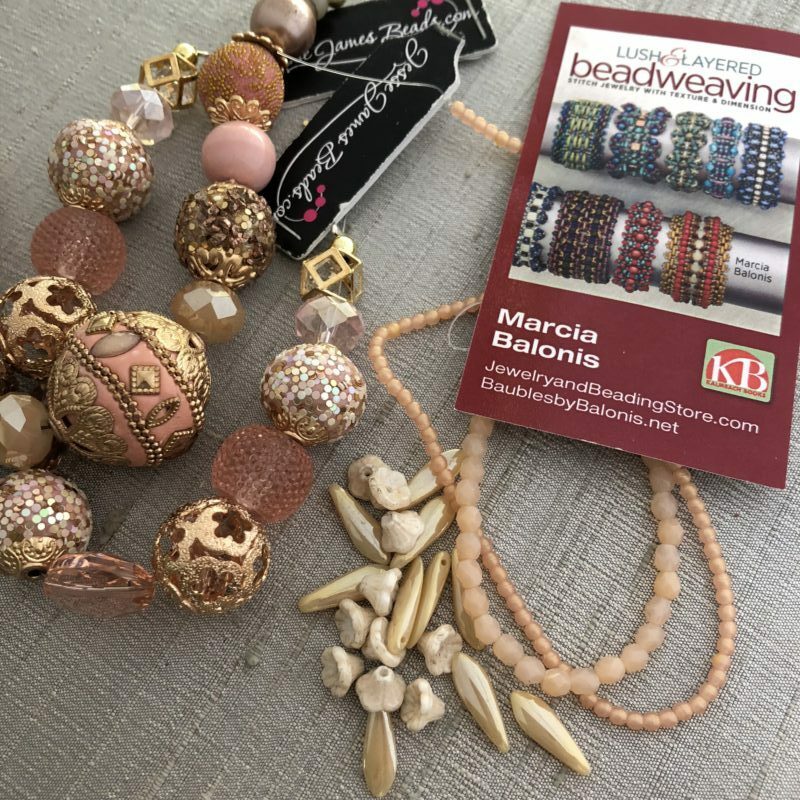 Marcia Balonis is a beading instructor and author. 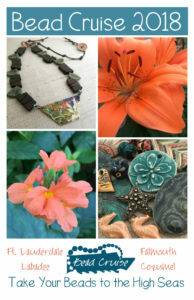 Her new book, Lush and Layered Beadweaving (affiliate link) comes out this summer. Marcia sent us a a collection of Czech glass to use in your jewelry designs. Starman Beads sent a super fun collection of their CzechMate beads along with three free project cards. Starman offers so many free projects on their site, stop by for a big dose of inspiration! 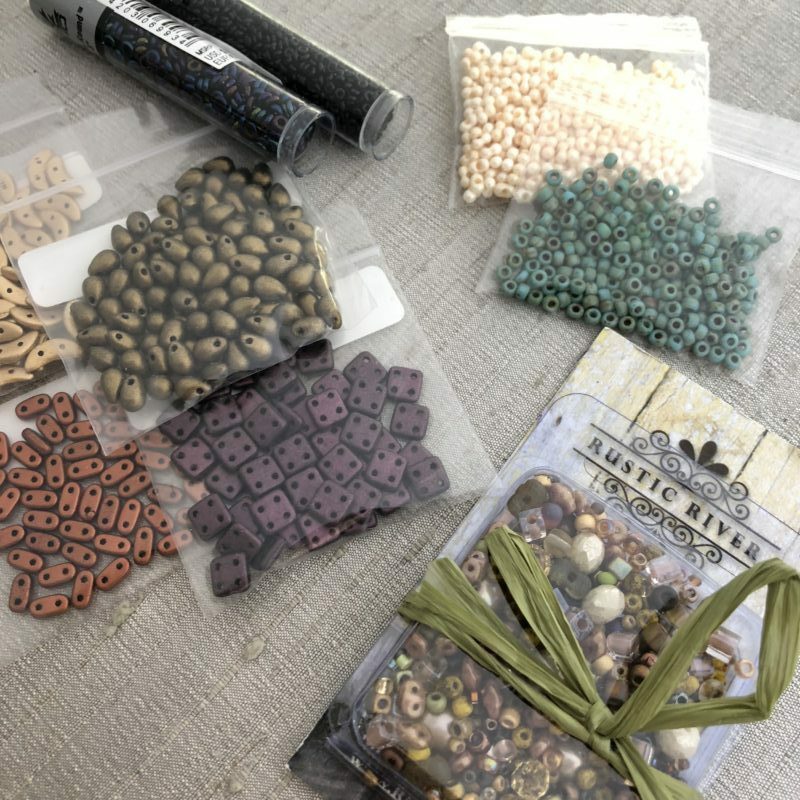 WhimBeads.com included seed beads and peanut seed beads. I love using peanut seed beads to add texture to my jewelry. 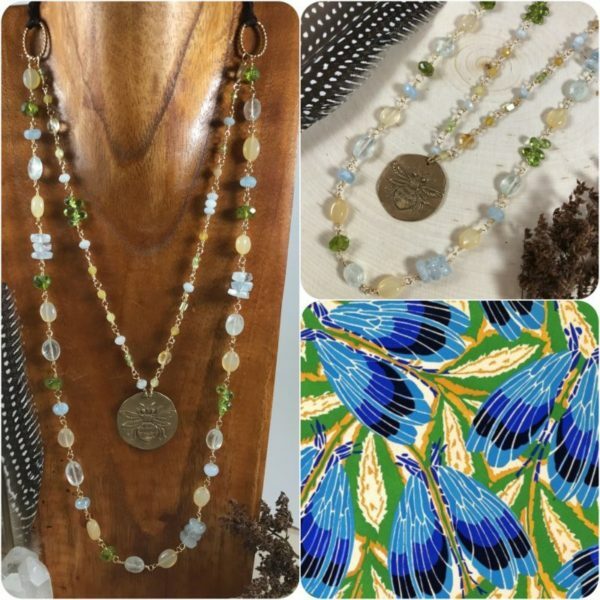 Rustic River Finds sent a mix of Czech glass and seed beads in a beautiful color palette. You could cook up quite a creation with this sweet bead soup mix. 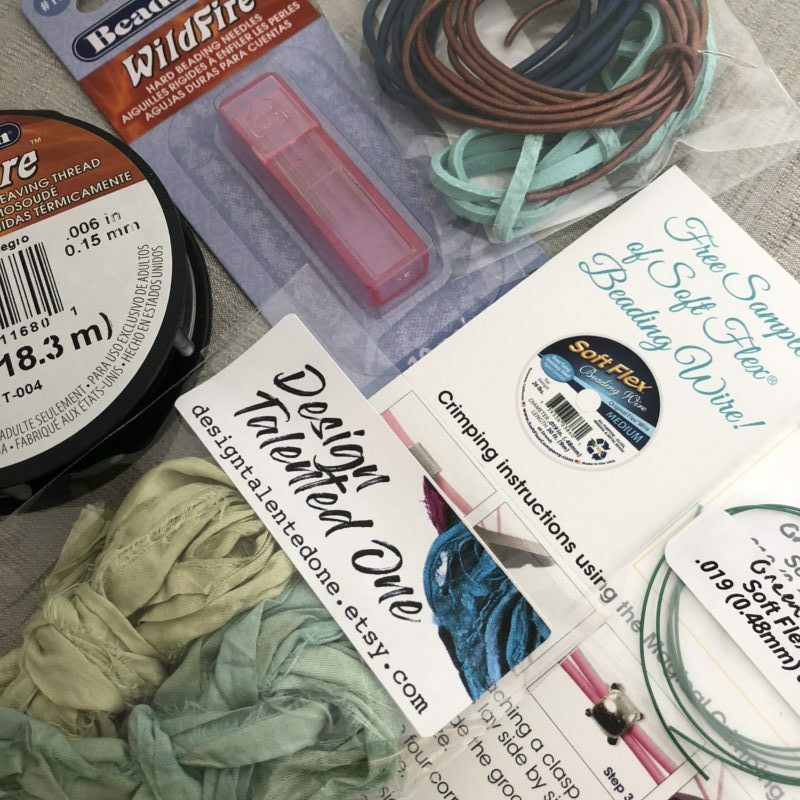 Beadlon shared a spool of their Wildfire thread and package of Wildfire needles with us. Perfect for beading with those tiny seed beads! Classic Elements on Etsy sent several types of leather cord for us to use, love the colors and mix of textures. Soft Flex included a project card with a sample of their beading wire in a fun color. Design Talented One sent hand-dyed sari silk in soft shades of green and aqua. Beads to Live By included a colorful tassel and a mix of Czech glass in summery hues. Join their Facebook bead shopping group to see what’s new in the store! 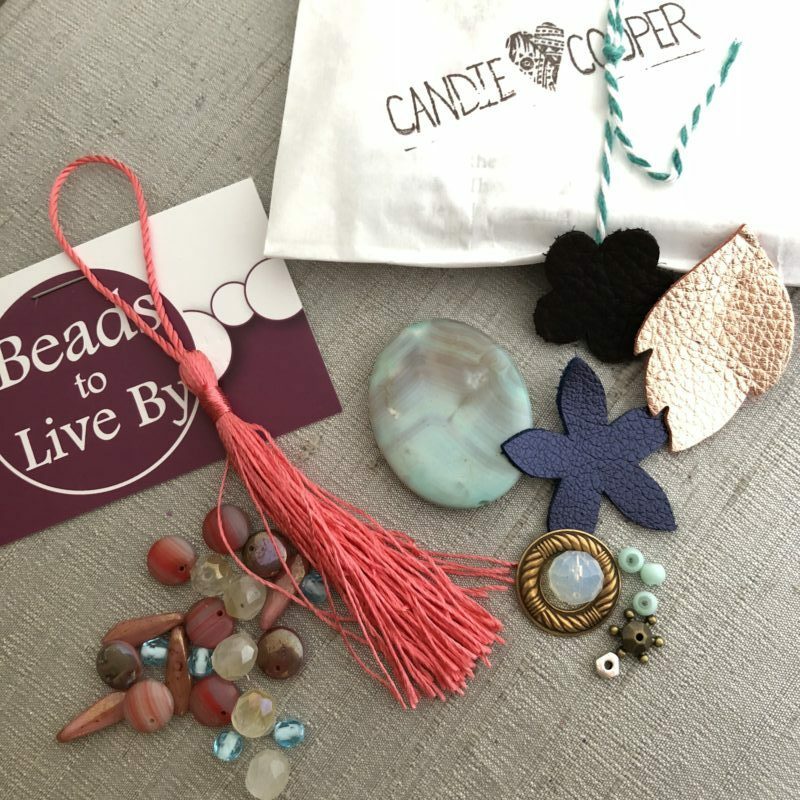 Candie Cooper sent along a kit to create a Bead Cruise inspired pendant and some samples of leather in fun shapes. Be sure to watch Candie’s Facebook live videos that broadcast every weekday at 2pm. And now on to the art beads! 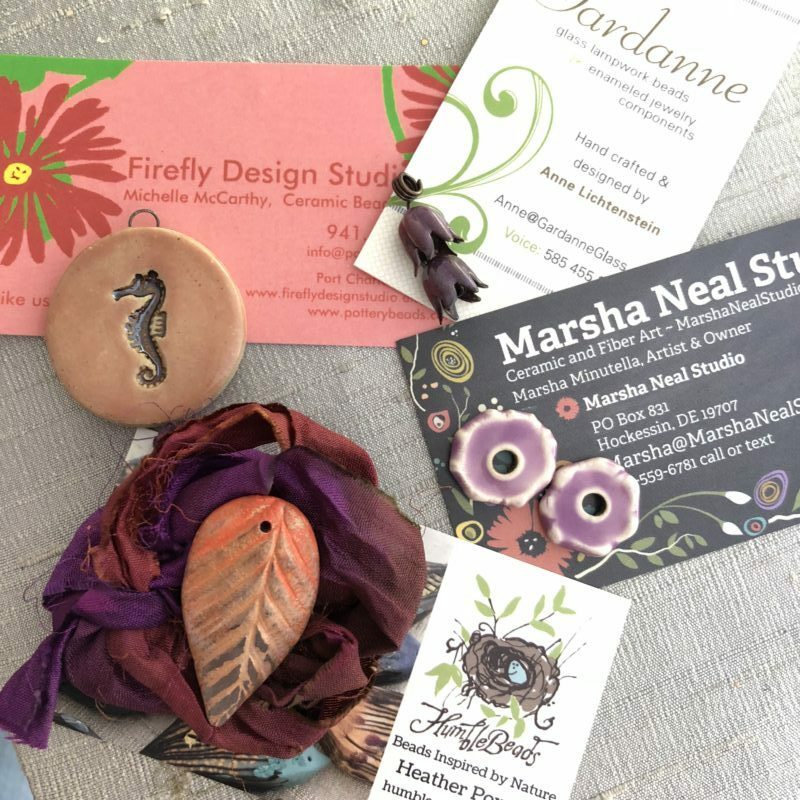 First up is an adorable ceramic seahorse pendant from Firefly Design Studio. Gardanne Beads sent enamel bead caps. They look so cute in earring designs! Speaking of earring ideas, check out the beautiful color on these ceramic disks from Marsha Neal Studio. 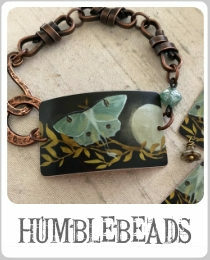 A polymer clay leaf in a bright tropical hue from Humblebeads is paired up with a sample of hand-dyed Sari silk to match. Another pair of enamel bead caps from Gardanne in a sunny yellow hue are found in the gift bag. A faux malachite charm from Tesori Trovati adds a nice punch of greens. 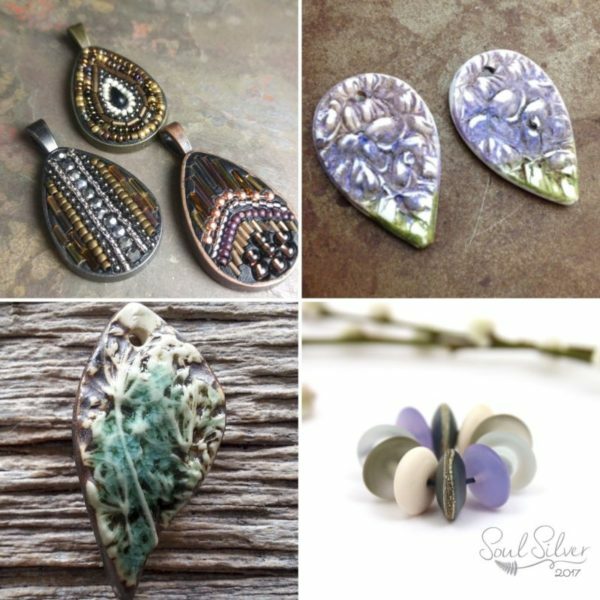 Ceramic artist Mary Harding created miniature charms of her earthy ceramic beads with floral and leafy themes. 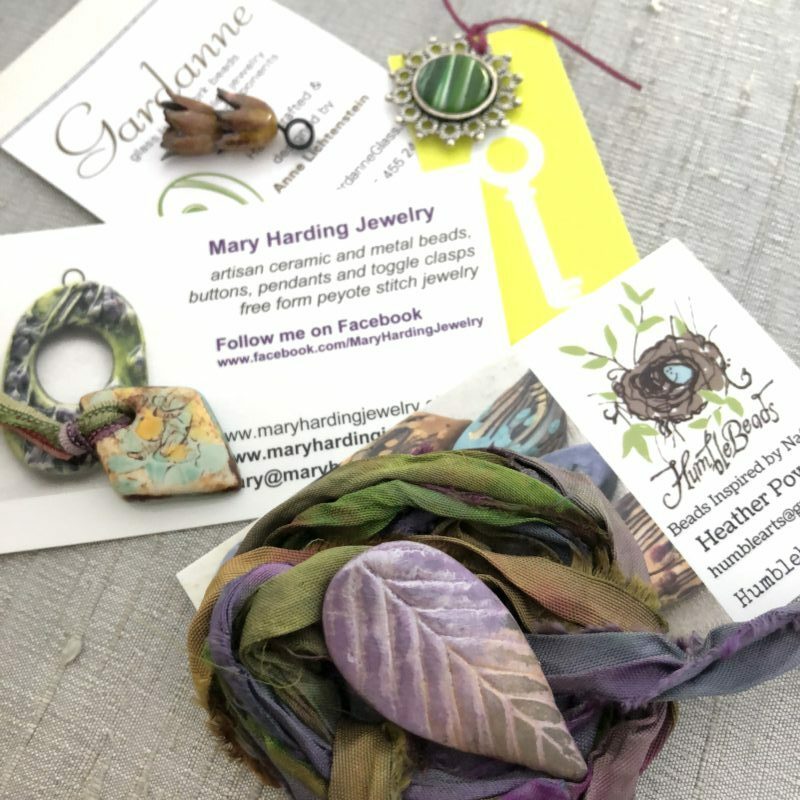 Another Humblebeads leaf in purple and a coordinating sample of sari silk round out our bag of goodies. Along with the gift bag the winner will also receive a printed copy of the Bead Cruise Booklet! Here are the details on how to enter the challenge. All you have to do is enter for a chance to win this awesome collection of beads and findings. Wow! What a lovely gift for someone. And this is such a great inspiration piece this month. Thank you for the link to the Bead Cruise booklet! Lucky winner! I was planning on entering anyway. This will move me into action. You are a very generous person.